These lightweight lifts are designed to take the strain out of any lifting job. 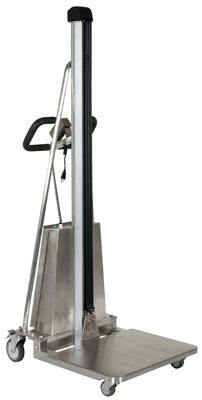 Ideal for use in narrow aisles and confined spaces. 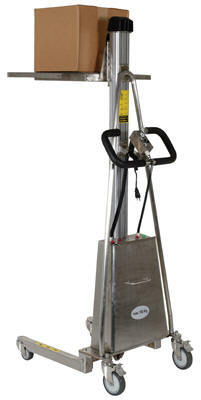 Platform height is adjustable with a manual hand winch. An auto brake system allows for controlled lowering. Quick change attachments available. Model MWP-330-DC-SS is constructed of 304 stainless steel. Includes two (2) 12V AGM batteries with an integral battery charger. 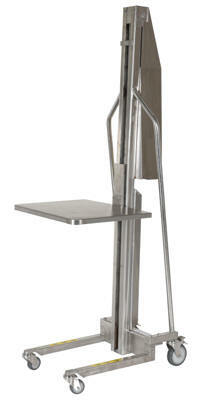 Robust, 304 grade, all stainless steel construction. Automatic electric overload protection system for maximum safety. Includes two (2) 12V AGM batteries with an integral battery charger. Two (2) 3" swivel load casters and two (2) 5" total locking swivel steering polyurethane casters. 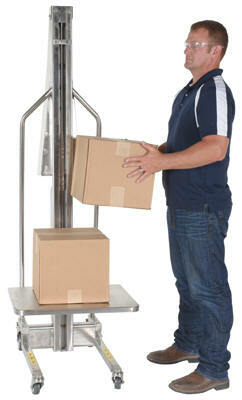 Maneuverability in narrow aisles and confined spaces.